The Holiday Season “Lift”- Time to check out! The Holiday season is a critical selling period in the U.S. retail market and December is the most critical month. In recent years, there has been an effort to push the “starting” date earlier. However, these earlier sales don’t occur in a vacuum. In this post we will try to put the November and December Sales in context with the total Holiday Lift…and the resulting yearend total sales. The best way to do this is visually with graphs so there will be a few more than normal. As usual, the data is from the U.S. Census Bureau and includes the just released Advanced Retail Sales for December. 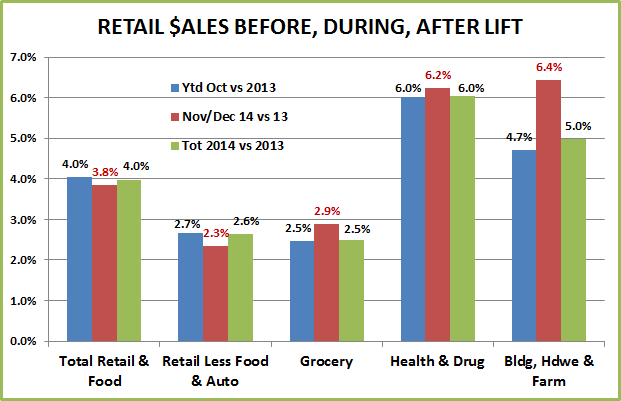 In this first section, we will take a look at retail sales for November and December of 2014 compared to 2013. The Retail less Auto and Restaurants is the most relative overall view for the Pet Industry. December was better than November but neither was as good as the ongoing increase through October. Grocery definitely had a great December. Drug had spectacular December which made up for November. Building, Hardware and Farm stores – Fall/winter is not their season but – a good December! The General Merchandise Stores include Department Stores, Discount Stores, Clubs, SuperCenters and Value stores. They are generally the channel trying to “push the season” earlier. It looks like the tactics worked…but the cost for a better November was a slower December. The Internet/Mailorder Channel was up 5.7% in November, slightly below their October YTD rate but they bounced back in December. Clothing and Accessory Stores had a good November and an even better December. This channel depends on a strong Holiday Season. Sporting Goods, Hobby, Book Stores and Toy Stores – Talk about a turnaround. Amazing! Miscellaneous Stores includes outlets like Florists, Gift and Pet Stores (Pet is about 20% of the total outlets). November was not good…as sales were down -1.0%. December sales were up slightly, but not enough to make up for November. We have looked at December sales vs YTD October and November. 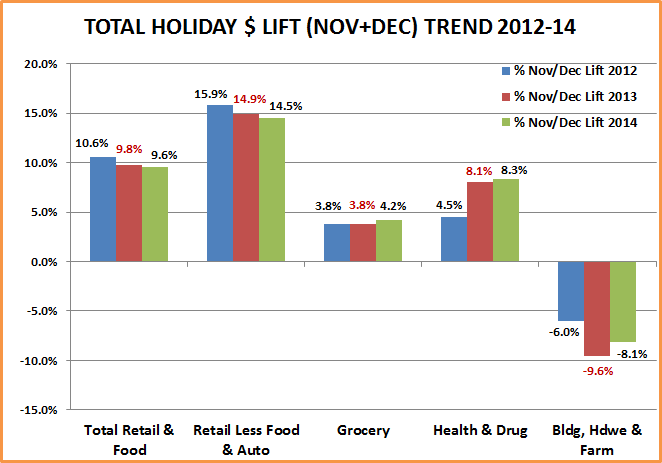 Overall it was stronger than November but didn’t quite match the rate of increase prior to the holiday season. We’ll give it a “C-“ Let’s next look at the % of December lift compared to recent years. In the total Retail Market, December was slightly better than last year. However, the Auto and Restaurant segments had a good December – up 10% in sales vs 2013. The Auto and Food Service Segments represent roughly 30% of the total Retail market. However, because of the nature of these businesses, the trends in these industries are often not directly comparable to the rest of the U.S. retail consumer products market. 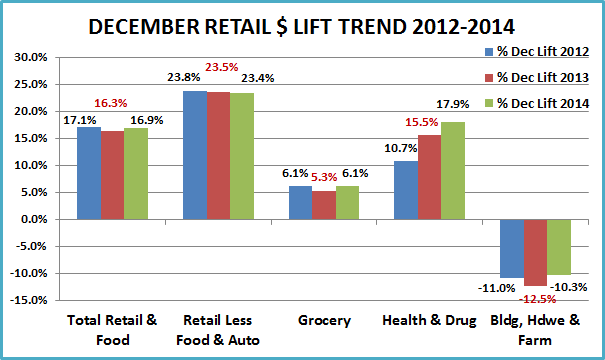 In 2014, when you look at the Retail Market – less Auto and Restaurants, the lift in December is pretty stable but actually trending down – slightly. Although Grocery stores don’t traditionally have a big lift, this December was definitely improved versus 2013.. The December lift in Drug Stores is steadily improving. This channel is a bit of a special case. Most of the sales are not driven by consumer choice but rather need. The past 2 years have seen rather intense flu and cold seasons…reaching epidemic proportions in December. As we have noted, the late fall and winter months are not a “lift” time for Building, Hardware and Farm stores. However, December 2014 was markedly better than last year or 2012 – the drop in sales versus October YTD was less. 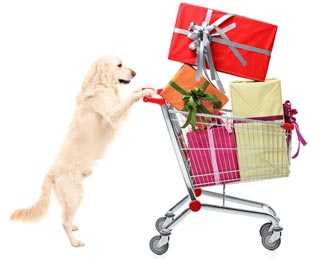 In the next chart we will take a look at Miscellaneous Stores which includes Pet and Gift outlets along with some major channels that are impacted strongly by the Holiday lift. To most U.S. consumers, the General Merchandise stores are the big drivers in the Holiday Sales Season. They are the most visible promoters and have been trying to push the kickoff time up a little bit in November. They have seen somewhat successful but as a result they have lowered the lift in December. The Internet/Mailorder has a strong…and growing December lift. 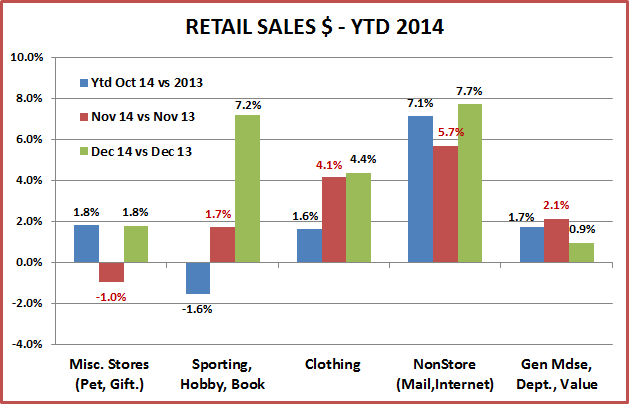 In December, Sporting Goods, Hobby, Book and Toy Stores almost doubled a normal preholiday month’s business – amazing! The December lift for Clothing stores is a big deal and 2014 was a good year. 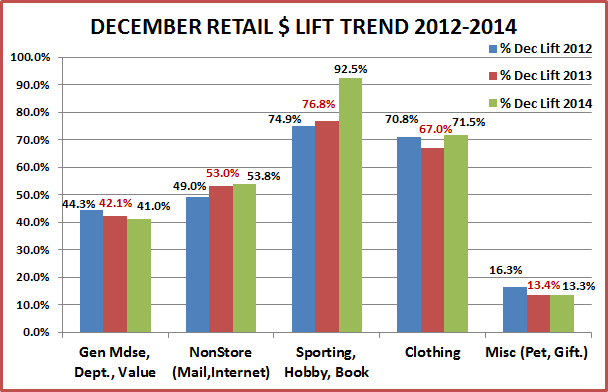 In Miscellaneous Stores (includes Pet and Gift) the December lift was equal to last year but down from 2012. 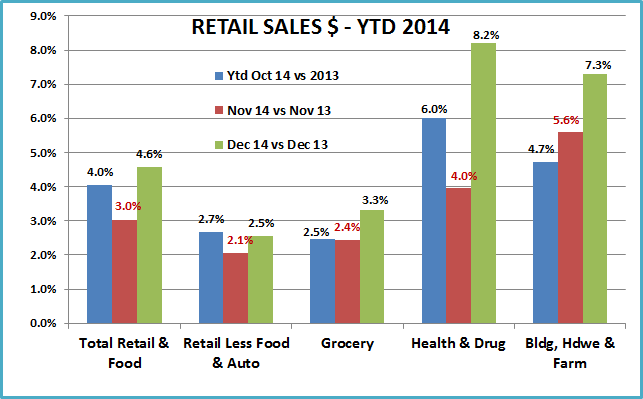 However, Grocery, Drug and Hardware/Farm stores had a good season! 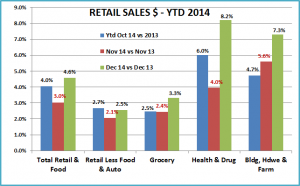 Business as usual in Nonstore retailers – continuing strong growth through the holiday season. Gen Mdse Stores – disappointing performance. Clothing stores– a good season: For Sporting Goods, Hobby and book stores…a “life” saver. Miscellaneous Stores – not a good season. Couldn’t make up the ground from a bad November. 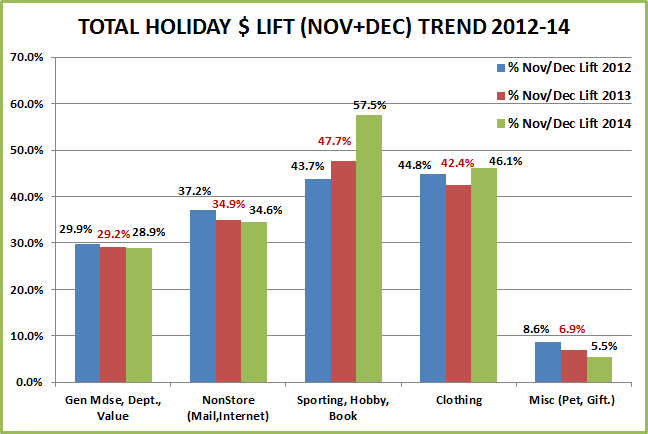 Lets take a look at the total holiday lift trends for the past 3 years. Let’s first put the overall Holiday List in perspective. We are measuring 2 months’ worth of sales which accounts for 16.67% of the available year. The percentage of total sales will vary by channel depending on how much they have come to rely on the lift. 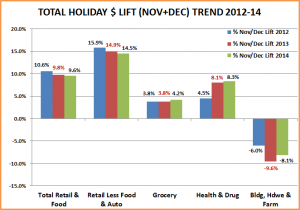 The overall retail market is showing a downward trend in the percentage of the holiday lift. In the (Less Restaurants and Auto) total, 18.6% of annual sales are done during the Holiday Lift so November and December are about 11% more important that an average month. 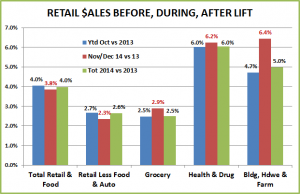 The lift in the Grocery channel is steadily increasing. However, with 17.3% of annual sales coming during the holiday period, the lift is not that important – only 3.5% greater than an average month. The lift in the Health/Drug channel has jumped markedly in the past 2 years. However, as we mentioned the occurrence of epidemic flu outbreaks is a major factor in the past 2 years. In all three years the total of November and December business accounts for about 17.8% of annual sales – about 6.8% greater than average. In Building, Hardware and Farm stores the November/Dec ember period accounts for only 15.5% of annual sales. So the question in this channel is how much lower will these months be than earlier in the year. Normally the total sales of the holiday months is about 7% below an average 2 month period. Of note, there was a definite improvement in 2014 over 2013. 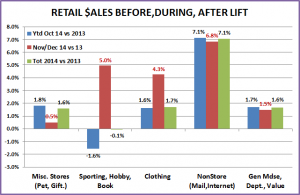 In the last chart let’s take a look at the lift history of some retail channels that are more dependent on the Holiday Season Sales. The lift in General Merchandise stores has fallen slightly over the last 2 years. They have also increased the November portion…at the cost of reducing December. Nov/Dec account for a consistent 20.5% of sales or about 23% more important than an average month. The NonStore channel has a strong lift but it is eroding. It has definitely become driven by December. It seems that the consumer may be making early season (Nov) purchases from the highly publicized Gen. Mdse stores …then switching over to the internet in December About 21.2% of total annual purchases occur in Nov/Dec making those months 27% greater than average. Sporting Goods, Hobby & Book stores generate 24% of annual sales during Nov/Dec, making those months up to 43% above average. The lift is huge in this segment and got even bigger in 2014. 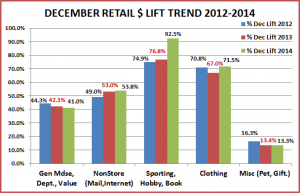 Clothing stores are also very dependent on holiday sales, with 22.6% of annual sales coming in Nov/Dec. This period performs 35% better than an average month. The lift has rebounded strongly in 2014 after a small dip in 2013. Misc Stores – (Pet Stores account for only about 20% of the outlets.) 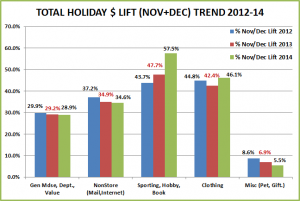 Overall the holiday season generates 17.4% of annual sales – only 5% above average. Even the small lift is dramatically falling. Sales in November were actually less than 2013 and December didn’t make it up. Final Thoughts – The holiday season is a major part of U.S. retail. In general, the lift is slowly but consistently decreasing. Efforts to push the season earlier have worked to increase November sales but at the expense of lowering the lift in December. The 2014 December sales increase was greater than last year but the combined Nov/Dec increase was not…and both were in the bottom 5 smallest % increases since 1992. Channels doing 42.9% of the total did add to their annual rate of increase through holiday business. Others doing 34.7% lost ground. Overall the “lift” earned a “C-”. Before we can do a final assessment of the total 2014/15 holiday season we have to measure the Jan/Feb “fall” which happens EVERY year.